This is the next request from a former co-worker that she is using to remember her deceased husband, Tony. 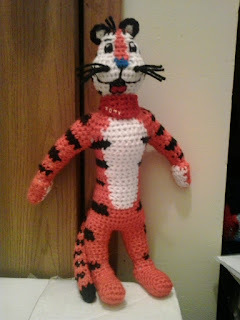 The pattern that I used for Tony the Tiger was an adaptation of my male character doll. Worsted weight yarn: Orange, black, white, blue, red, and yellow. BEGIN STUFFING RIGHT ARM FIRMLY. CONTINUE STUFING AS YOU GO ALONG. Rd 23: Ch 1, turn; sc in each sc around, slip st in first sc. BEGIN STUFFING TAIL FIRMLY. CONTINUE STUFFING TAIL FIRMLY AS YOU GO ALONG. Rd 25: Ch 1, turn; sc in next 5 sc, holding next sc on BODY and sc #14 on LEFT ARM together and working through both thicknesses, sc in next 4 sc, sc in next 4 sc on BODY, change to white, sc in next 6 sc, change to black, sc in next 4 sc, holding next sc on BODY and sc #14 on RIGHT ARM together and working through both thicknesses, sc in next 4 sc, sc in next 5 sc on BODY, slip st in first sc changing to orange. Finish off leaving a long tail. Weave tail through sc of Rd 49, pull tightly and secure. Weave in ends. Using black, embroider eye, eyebrows, and upper lip. Using red and black, embroider mouth. Finish off leaving a long tail. Sew EARS to TONY THE TIGER. Fringe on pieces of black yarn on each side of nose of TONY THE TIGER. Fringe on a piece of black yarn on head of TONY THE TIGER between EARS. Finish off. Weave in ends. 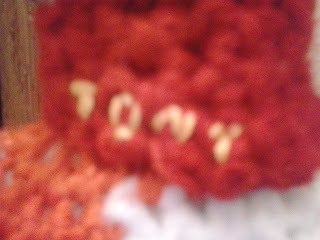 Using yellow embroider floss, embroider “TONY” on BANDANA. Wrap BANDANA around TONY THE TIGER’s neck and tie together. Tony the Tiger is copyright Kellogg’s and their respective creators. This crochet pattern is an original pattern and is © by Christjan Bee (March 2018). Please do not claim this pattern as your own. If you wish to share this pattern, you may link to this pattern but please do not reprint/repost it on your site. You may print and keep a copy for your own personal use but you may not sell or distribute it, or sell items made from this pattern.